Juicy, sweet and citric, tamarillo or tree tomato is a small oval-shaped fruit. It is closely related to other Solanaceae members of vegetables and fruits such as tomato, eggplant, tomatillo, groundcherry, and chili peppers. Tree tomatoes are thought to have originated in the semitropical high altitude Andes forests of Brazil and Peru. The fruits cultivated on a commercial scale in large orchards in northern parts of New Zealand and exported to USA, Australia, Japan and European Union countries. Some of the common names include tomate de arbol (Spanish), tomate de arvore (Brazil, Portuguese), and tree tomato (English). Scientific name: Solanum betaceum (Cyphomandra betacea). Tamarillo is a shrub or small size tree reaching about 5-15 feet in height with hairy stems and branches. Its evergreen leaves are broader than in tomato. A well-grown plant bears small fleshy pale-pink attractive flowers in the first year of plantation. However, fruiting is discouraged until it reaches second or third year. Tamarillo fruit features an oval shape with smooth, shiny skin and can be of different colors depending upon the cultivar type. Red tamarillos are more common than orange-yellow varieties. Fully grown fruit features oval, measuring about 6-8 cm in length and 4-6 cm wide, weighing about 100 grams. On the inside, cut section appears similar to that of in plum tomatoes. The flesh is juicy, deep in color, sweet yet tangy, flavorful, filled with many small flat, circular edible seeds that are slightly larger than in tomatoes. Tamarillos are one of the very low-calorie fruits. 100 g of fresh fruit contain just 31 calories. They contain slightly more calories, fat, and protein than tomatoes. (100 g tomato has 18 calories). Nevertheless, they have good amounts of health benefiting plant nutrients such as dietary fiber (3.3 mg or 9% of RDA), minerals, antioxidants, and vitamins. Acidic flavor (sourness) of tree tomatoes mainly comes from citric acid. The other important acid in them is malic acid. The ORAC value (antioxidant strength) of 100 g fresh tamarillos is 1659 TE (Trolox equivalents). Their antioxidant value primarily derived from poly-phenolic, flavonol and anthocyanidin compounds. Some of these phytochemicals include chlorogenic acid, kaempferol, and anthocyanin pigments such as cyanidin glycosides, especially concentrated in their skin. Scientific studies suggest that Chlorogenic acid helps to decrease blood sugar levels in type-II diabetes mellitus. 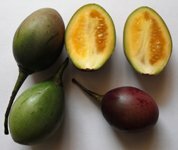 Yellow and gold variety tamarillo contains more vitamin-A and carotenes than red varieties. However, red variety has more anthocyanin pigments. In addition, yellow tamarillos are an excellent source of carotenes and xanthins. These compounds possess antioxidant properties and, together with vitamin-A, are essential for good visual health. Further, vitamin-A is also required for maintaining the integrity of mucosa and skin. Consumption of natural vegetables and fruits rich in flavonoids help protect from lung and oral cavity cancers. Tree tomato is a modest source of B-complex vitamins such as thiamin, riboflavin, and pyridoxine (vitamin B-6). Together, these vitamins help as cofactors for enzymes in metabolism as well as in various synthetic functions inside the body. They are indeed a very good source of electrolyte, potassium. 100 g fresh fruit has 321 mg or 7% of this mineral. Potassium is an important component of cell and body fluids helps controlling heart rate and blood pressure; thus, counters the bad influences of sodium. Also, the fruit contains a few minerals such as copper, manganese, magnesium, phosphorus, zinc and iron. Tamarillos (Cyphomnadra betacea), red, fresh, flesh and seeds, raw. 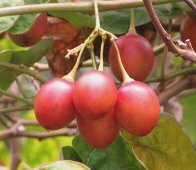 Nutrition value per 100 g.
Tamarillo season begins in New Zealand from May until October. Choose well-developed, bright, uniform colored, ripe and ready to eat fruits. Tamarillos are available in several attractive colors of orange, golden yellow, deep red, maroon, etc. Look for the healthy stalk. Avoid small, shriveled, damaged and bruised fruits. At home, ripe fruits may stay well for up to 5-7 days and inside the refrigerator for up to 10 days. Raw, ripe fruits can be eaten with the peel. However, its skin is bitter in taste (largely because of cyanidin anthocyanin pigments), and many may want to avoid eating it. At home, wash them in cold water and mop dry using a soft cloth. Remove the stalk. In general, the fruit is cut in halfway, and its sweet, juicy flesh scooped out using a teaspoon. Its skin may be peeled and discarded in the similar fashion as in tomatoes. Rinse the fruit in hot water for 2-3 minutes and cool it immediately by immersing in cold water. Then using a knife, make a small nick on the surface and gently peel using fingers. Tamarillo slices used in decorating fruit/green salads. Its slices served as toppings on cakes, ice creams, sandwiches, etc. Its juicy pulp can be pureed and blended to prepare smoothies, sauce, salsa, jams, jellies, etc. Tamarillo fruit intolerance is a rare event and may occur because of cross-allergic situations to other Solanaceae commoners like eggplant, tomato, tomatillo, etc. (Medical disclaimer). <<-Back to Fruits from Tamarillo. Visit here for an impressive list of all variety of fruits with complete illustrations of their nutrition facts and health benefits. New Zealand Tamarillos- Nutritional composition.